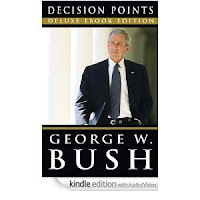 So here's the thing about Bush's memoirs: it's not a debate. He's not trying to justify, but simply explain, his decisions. It's a dry book. Much of it is boring play-by-play commentary, but occasionally it's a fascinating description of what really happened. Bush is not introspective. He does not believe in second guessing decisions with the benefit of hindsight. It's not important what we know now; what's important is what he knew then. The purpose of his book was to explain what he knew then. Everybody knew Saddam Hussein had WMDs before we invaded Iraq, the fact that he didn't is irrelevant to the decision to invade. Questions like "Would have you decided differently with what you know now?" make no sense to Bush. Sure, we know now Iraq had no WMDs, but that doesn't change what people believed then. It's like asking if Batman could beat Spiderman in a fight. Sure, lots of people would love to discuss that, but that's an imaginary world. Bush's lack of introspection or doubt defines his character. But is also defines his adversaries, the liberal pundits, who want to cast doubts on his decisions. Liberal pundits are frustrated that they can't get Bush to admit he was wrong about WMDs. 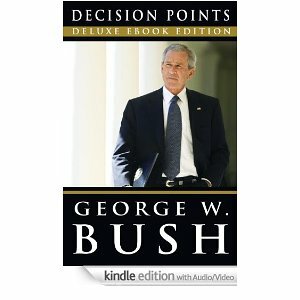 They just can't grasp Bush's answer, that the only "right" decision at the time would assume that Iraq had WMDs. Even if he decided not to invade, he still would have had to do something about the WMDs that everyone believed existed. Waterboarding is another good example. Bush's lawyers advised him that it was a legal interrogation method. And therefore, it was legal. Even I get a little frustrated with Bush's obstinacy on this issue, because he can't grasp the idea that just because his lawyers said it was legal doesn't make it so. But on the hand, I can see his point: the information he had available at the time was that it was legal, and therefore, any decision he mad had to be based upon that as being the "fact". I learned from the book that only 3 people were waterboarded during Bush's presidency. I had never heard that before -- the media leaves the impression it was widely used on the nearly thousand people that went through Guantanamo.Those three people were Khalid Sheikh Mohammed, Abu Zubaydah, and Abd al-Rahim al-Nashiri. Khalid Sheikh Mohammed was the guy that planned almost all Al Qaeda's major terrorist attacks, including 9/11. He was the most important Al Qaeda guy we wanted to capture -- more important even than Bin Laden. But here's the question I'd ask Bush: "If wateboarding was as legal as you say, why only 3?". I think Bush is being a bit disingenuous here. That's the sort of question his opponents should ask. Liberals make a lot of good arguments NOW about waterboarding, but what's important is what Bush knew THEN. Back then, he was faced with a little known technique that was nearly certain to stop another attack on the scale of 9/11. Another interesting bit was his handling of Katrina. His book describes how he was engaged with preparing for the hurricane before it even hit, and was continually engaged from then on. And by the way, all this is documented facts, so he's not making any of this up. This paints a different picture than how the mainstream media describes it. He probably deserves some criticism (a better leader would have overcome the obstacles he describes in his book), but it's clear he doesn't deserve the derision he continues to get about Katrina. Though the biggest value of his book isn't these great "debates", but the look into his presidency, his character, and his relationships with other people. While he doesn't appear to be any great intellectual, Bush comes across as a likable, honest guy. The man I see in his book is vastly different than the man I see caricatured in the media, especially on left-wing shows like Jon Stewart's.